Yi-Chun, born in 1970, is a learned horticulturist and landscape architect. Back in 1996, in her Tai Chi School in Berlin, she rediscovered her love of tea. Her first memories about tea are connected to her Grandfather who introduced her to traditional Oolong tea. Later, during her university time in middle Taiwan, Yi-Chun regularly passed some free time with her friends visiting numerous teahouses, beautiful as well as plain ones, just to enjoy tea together. 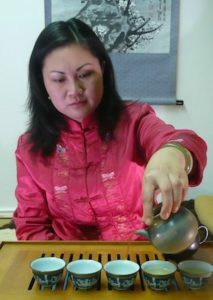 Since then, she cultivated her knowledge about tea by in-depth reading, practising tea ceremonies and by visiting several cultivation areas in Taiwan. 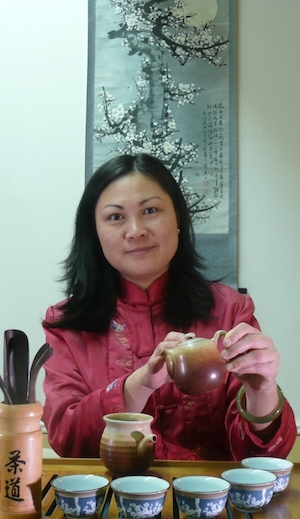 As a host of a website about Formosa teas, which she launched in 2004, Yi-Chun has been counselling many tea lovers all over Europe. At this year’s Yangsheng Meeting, I would like to taste some delicately produced Formosa Oolong tea varieties with interested participants in a sociable and healthy way. Please do not think of the strict Japanese tea ceremony or formal tea ceremonies held in Buddhist temples. The focus will lay on Yangsheng through joy, relaxation and concentration. The tea drinkers, sitting next to each other, will experience tea as a means to encourage easy communication or arbitrary silence or as an agent changing the sensual perception. Where do these effects come from?